The most underrated tool in business for driving up your results – a good strategic plan! A good plan will fit on one page and be the guiding light for everything that happens in the business. If it is a lengthy document and put together badly, then yes, it is a waste of time and yes, it will sit on a shelf and collect dust. If there is a very low level of strategy in the business and a low level of execution, then basically the business is GOING NOWHERE. 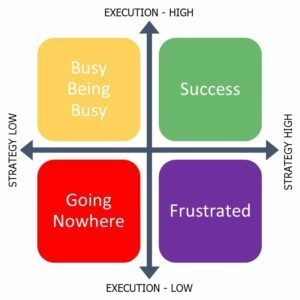 If there is a low level of strategy but high execution, then the business is BUSY BEING BUSY! In other words, lots of day to day activity but no vision of where the business is going! When there is a high level of strategy and planning but low level of execution, then everyone in the business is FRUSTRATED. A high level of strategy and good execution leads to SUCCESS – provided the strategy is a good one! That’s where the testing comes in.